Colorado's Sixth Congressional District was the focus of a piece that appeared on "America With Jorge Ramos" on Fusion TV. For those unfamiliar with Jorge Ramos, he is often cited as the most popular Hispanic news anchor in America, in part due to his position as lead anchor with Noticero Univision. Ramos has a very direct interview style that attempts to get right at an issue, and those skills were on display during interviews with both Rep. Mike Coffman and Democrat Andrew Romanoff. Ramos: Do you support, right now, immigration reform in the House? Coffman: "I do. I just think there's gotta be a middle path to this. I believe in a step-by-step process. We can have a comprehensive approach without having one massive bill. But we've got to move forward." Good Gravy! Is there a better example of parsing phrases — not even just words — in a more meaningless fashion? Last July, Coffman wrote an Op-Ed for the Denver Post in which he said, "The time has come for comprehensive immigration reform." 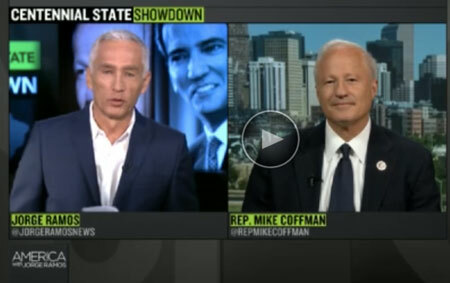 Coffman now says that comprehensive immigration reform is bad, which is a complete reversal. Ramos did his homework on this issue and was aware of Coffman's changing rhetoric, which came to a fantastic conclusion above when Coffman just tried to fit every buzzphrase he could think of into one answer…saying absolutely nothing in the process. Ramos: So did you change your mind on immigration? Of course, this is a very truthful answer to a somewhat limited question. The question should have been, "So are you still changing your mind on immigration? Coffman could still have truthfully answered 'Yes,' though that is exactly his problem right now. Mike Coffman is saying anything about everything (or everything about anything, if you prefer), and he's clearly hoping that voters are too stupid or too preoccupied to notice. It is often a telling sign about the direction of a race when incumbent candidates such as Coffman just start taking every position on an issue; that means you're (a) not confident about what you're selling, and/or (b) not confident that voters like how you are selling it. But what if voters do see what's happening? Candidates that have discovered their path to victory don't usually find it necessary to reach out in every direction at once. Would you like some dressing with that worthless, meaningless word salad, you mealy-mouthed tool? Be respectful or Andrew Romanoff will fire you. Oh Zippy, you're so boring. a comprehensive approach without having one massive bill. Easy. You do it step-by-step. From the middle. Coffman is also touting his "pro woman" cred. in this ad.. I hope Pols or someone writes a takedown of the ad, because I'm needing to do other writing and work for awhile. Wow. I just watched both interviews, and that was pretty devastating for Coffman. Would have been nice to see a more substantive discussion on guns, though. It seems like the interviewer was unaware of most of what's happened in Colorado on that issue, and as a result, didn't ask pertinent questions of the candidates on the issue. I wish he'd nailed down Coffman to express support or opposition to the gun bills that were passed last year. And I wish he'd asked Romanoff about what else we need to do, instead of a silly question like "are you for background checks?"